Whimsy by Shellye: A Snap! after cutting the pieces out, I set out to play! 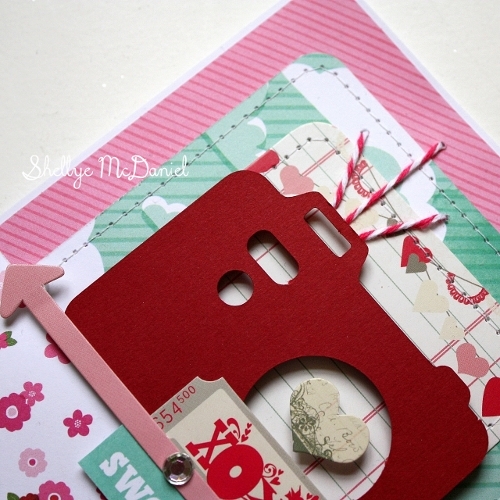 I chose the camera die-cut and went from there building the focal point of my card. I cut the base paper to 1/2″ smaller than the actual card. 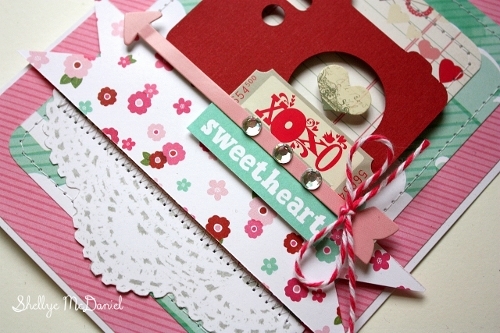 Next, I cut a smaller mat from the clouds paper and corner rounded the edges to mimic the journal card by Pink Paislee. Layers, layers and more layers! A fussy cut piece of doily peeks out from under the hand-cut banner. Use foam squares to create dimension and don’t be afraid to layer two foam pieces together to give an embellishment even more height. Wanting another touch of the aqua color to tie in with the mat, I cut the word ‘sweetheart’ from the bottom of the clouds paper and attached it amongst the other little die-cuts that I clustered around the camera’s shutter. And a camera wouldn’t be a camera if it weren’t snapping a picture every-now-and-then. Using a piercing tool and mat, I created holes that I stitched with baker’s twine to create a ‘flash’ effect! The February Paper Bakery Kits will be on sale soon!